Call now and schedule for only $79, per heating system. Check, adjust and clean blower components – Removing excess dirt buildup will insure proper airflow and system balance. This increases capacity and unit reliability. Check and adjust air flow and fan control for accurate temperature rise – This assures the fan comes on and off at the predetermined temperature, making heating a room more accurate and efficient. Check standard air filters – A clogged filter can reduce airflow and even cause a system to cease operation. This also prevents dirt and other residue in the filter from cycling back into your home. Check thermostat calibration – An improperly calibrated thermostat will cause your furnace to over or under heat your home. Calibration saves you money and increases your comfort. Lubricate moving parts (when necessary) – Poor lubrication causes motor and shaft drag, requiring more electricity to overcome resistance. This can also help extend motor life. Check heat exchanger – Inspection of the heat exchanger locates cracks and separations. These cracks and separations can result in dangerous carbon monoxide leakage, putting your family in danger. Check high limit and other safety controls – This is the principle control in the furnace to prevent overheating and possible damage to the unit and the structure it is located in. Checking these controls can prevent fires and extend your furnace’s life. Check for flue obstructions – This insures proper exhaust of toxic furnace fumes, ensuring your family’s safety. Tighten all electrical connections – This is necessary to prevent wire overheating that may cause fire or part failure. Check belts for cracks and wear – Belts must be checked periodically to insure reliable operation. Check burner operation, clean if necessary – Proper burner operation is essential for an efficient furnace. Check thermocouple, replace if necessary – This is necessary for proper ignition of burners, and prevents possible explosion upon burner startup. Clean and adjust pilot, as necessary – Adjustment insures smooth ignition, and burners are observed for proper firing. This saves fuel and insures proper ignition. Check gas line for leaks from furnace shut off valves to the burners – This insures that potentially poisonous gases are exhausted properly and do not leak into your home. 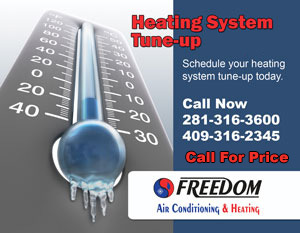 Call today to schedule your heater tune up 281-316-3600 or schedule on-line.